The EtherTek POEx2 passive PoE Injector is a device that allows you to power two PoE devices with up to 60 volts DC. The EtherTek POEx2 passive PoE Injector allows you to power two PoE devices with any power supply of your choice including AC/DC transformers or battery banks. The POEx2 does not provide standards-compliant 802.3af PoE support, but lets you decide which power supply is best suited for your needs. High Current 2.1mm power jack suits many common AC/DC transformer (wall-wart) power supplies. Can be used with 12, 24 and 48 volt battery banks. Input up to 60 volts DC. Output voltage is the voltage of whatever you feed into it. 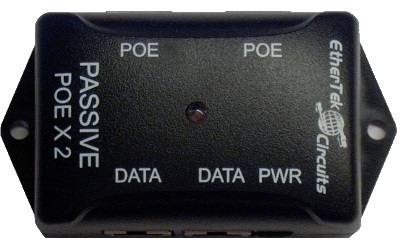 Dual channel, suitable for powering two PoE devices. Top RJ45 locking tab for easy cable insetion or removal. Ultra Low power Super Bright LED power indicator. Works with Mikrotik™, Ubiquiti™ and other PoE devices.